Shisha smoking is a way of smoking tobacco using a bowl with a hose. The smoker uses the mouthpiece of the tube to breath in the smoke. When it comes to the hookah bowls, there are wide varieties of bowls to choose from; there are shisha bowls such as vortex, dome, and Twin among other bowls hence leaving your head reeling about the best option to go for. These shisha bowls offer various advantages over other bowls. On the other hand, a rind of fruit can be used as a hookah fruit head as well. The Hookah fruit bowl is the most popular shisha flavor-enhancer and a great bowl-on-the-fly. Over the time, there has been an endless debate about the best bowl between hookah fruit bowl and shisha fruit bowl. People sternly stand by their choice. Regardless of where you stand, it’s always fun to change your hookah bowl occasionally. If you’re pro hookah fruit bowl, you can try different fruits such as apples, pears, pineapples, oranges, or watermelons. For pro shisha bowl, you can give a try crown bowl, phunnel bowl or vortex bowl and many more. Fruit Vs Shisha Bowls: Which is the best? When using a shisha bowl, your smoking experience largely depends on the materials, design, and style of the shisha bowls; therefore, if you don’t get the desired shisha bowls, your smoking experience may not really be enjoyable. This one factor sets back the hookah shisha bowl even though some are beneficial in smoking certain flavors like vapor paste flavors. Some shisha bowls are the best for some flavors; however, they may not be ideal since the juice flow down the bowl into a water jar beneath. This is common when juice or liquid form flavor is used. Shisha bowls may also not be good for steam stone flavors and may also not be easy to clean if you don’t maintain it regularly. Furthermore, it can also be damaged or broken if it falls out. 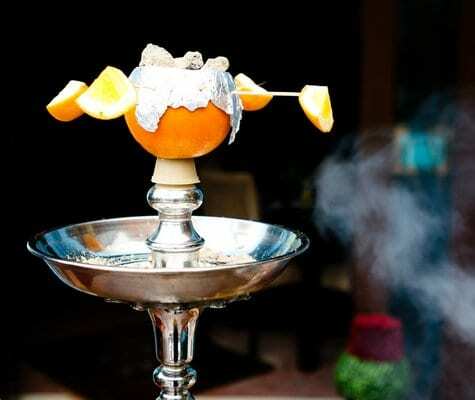 Arguably, these setbacks associated with shisha bowls make hookah fruit bowl/hookah fruit head the best option. What makes Hookah bowl out of fruit the best? The hookah bowl fruit is one of the best and simple ways of adding a bit of glamour to normal hookah setup. By using fruit bowl flavor, you are assured of extra flavor to your session and increases longevity by adding some moisture to the shisha. In addition, making hookah bowl out of fruit is easy and simple; you can be creative with it, however. Furthermore, a hookah session with a fruit bowl looks neat and impressive; in fact, firm and less juicy fruits give the best results. Melons, Apples, Pears, and pineapples work great. It may really be difficult to pick the best between the two hookah bowls. Nonetheless, the hookah fruit bowl stands out as compared to Shisha bowls even though this debate will not be settled anytime soon. The simplicity, easy cleaning and maintenance, and flavors of hookah fruit bowl brings an awesome hookah smoking experience!